Sumak! 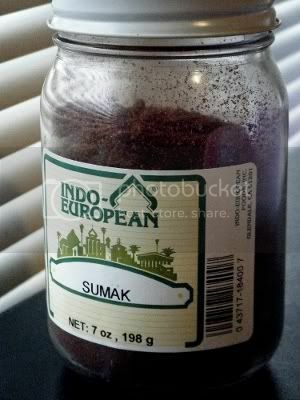 Or more commonly spelled, Sumac. No matter how you spell it, it's great stuff. And it goes especially well with this sweet potato hummus. 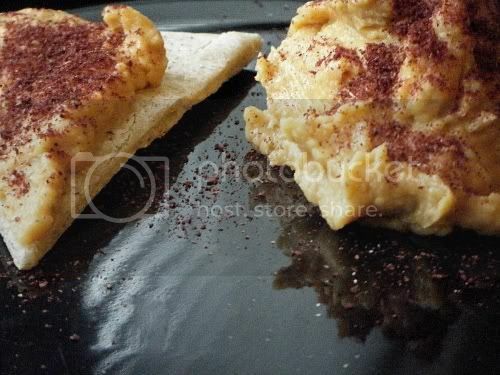 If you're not familiar with sumac, it's very tart (which is why it goes so well with this hummus- it adds a great balance to the sweetness) and has just the slightest hint of heat to it. And I do mean slightest; on a scale of 1-10 for your average non-chili-head person (1 being Bell Pepper, 10 being Call An Ambulance Before I Die) it's probably a 2. Maybe a 2 1/2. So don't worry if your taste buds can't handle anything much spicier than mashed potatoes- you'll be safe, I promise. Sumac has about the same look and color as your average chili powder, and is very common in Middle Eastern cooking. More info can be found here, and on Wikipedia. It's becoming more and more common here in the States, and if you live in a decent-sized city with a good Asian market (or better yet, Middle Eastern grocery stores) you're definitely in business as far as finding it. But even if you live out in the middle of nowhere, it can be easily found online, and for not a lot of $$. In general, it goes for around $13-20/lb. but can be had for much less. I think I paid around $4.50 for this 7 oz. jar at a local store, and even have a 12 oz. bag of a different brand that cost around the same. (I'm trying out various brands I find, just to compare. So far, this Indo-European brand, at about $10/lb. compares favorably to Penzey's, at around $22/lb. [+ shipping, if you don't have a local store.] But Penzey's is generally more expensive than other places anyway.) But even at $20+/lb. it's still worth it- a little goes a long way, so a pound is a whole lot. Bottom line: it's freakin' delicious, and you should try it out. I saw them one day at my (old) local asian market and picked up a few, not really knowing anything about them. So I popped one in the oven and baked it. 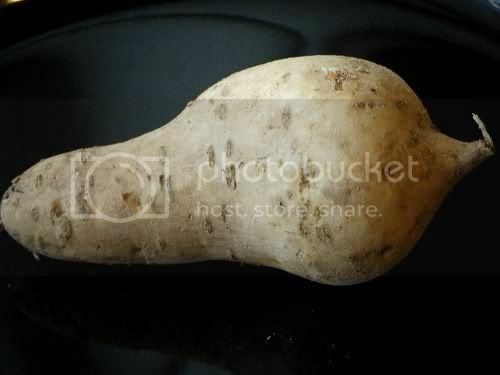 It tasted like a weird mix between sweet and white potatoes. The white part tastes like your average white potato, and the purple part is sweet. It's an oddly interesting mix when you eat one baked (the potato, I mean). But what I found out is that it makes a really, really good sweet potato hummus variation. You just use the same recipe, but use these instead. Honestly, it doesn't look all that appetizing once it's all blended up- it's actually almost gray-colored- but man does it taste fantastic. It's like regular sweet-potato hummus kicked up a couple notches. Definitely different, and definitely good. These pots are probably a bit hard to find, unless you live in a decent-sized city, though. (No, that wasn't a typo- working in a commercial kitchen for a living, I generally call potatoes 'pots,' at least when it comes to writing/typing the actual word.) I first found them in St. Paul, MN, a town of a few hundred thousand people or so, and I can still find them here in Nashville, but in both cases, generally only at Asian markets. Also, I can't seem to find a standardized name for them. Often in St. Paul, and even around here, they're unlabeled. 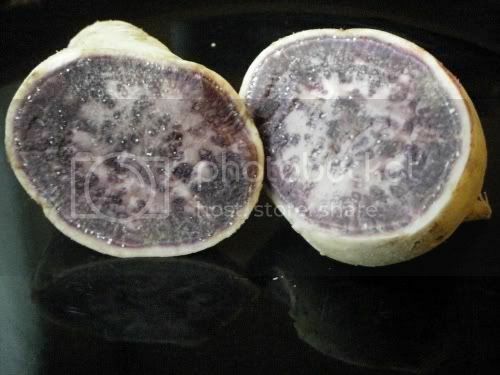 But sometimes they're labeled as Purple Yams, so I don't actually know what sort of variety of potato they really are. But if you can find them (and they're generally kinda pricey- I think I pay twice what regular white or sweet pots go for) they're totally worth a go. I always use them to make hummus, but even baked (or for whatever) they're really different, and really good. And one last thing I didn't actually forget to mention in the last post, but have since found out, is that instead of using fresh, minced garlic, try out roasted garlic in the hummus instead! It makes a subtle, but tasty, difference. Ok, friends, over and out, but before I go- up next we have a really sweet (as in kickass, but also sweet flavor-wise) cranberry sauce, a really kickass new Banh Mi recipe, and a couple other tasty treats. Stay tuned!